Spirit, oh Spirit… This makes me want the Squishable fox and wolf! Awwww, that is fabulous. I really hope the next time my friends are at a Who convention there’s some Squishable Dr Who cosplay happening. Aww….So cute! I love it Melissa! Heh heh this is great… love it… but did you guys notice in the 4th panel, Dr. Wolf’s left foot isn’t on the ground? The Doctor is just being tilty. Trust me, I’m a doctor (although not the medical kind) and am frequently tilty. Even without booze being involved. Yeah! Or maybe, he had to stretch up to reach the door. Tee hee. But the Squishable wolf doesn’t have a long tail like that! It has a small, fuzzy, white bunny tail! Speaking of which, you guys should redesign the bunny, if you’re not already. Oh,oops in the picture I saw of the wolf, it looked like it had a bunny tail. oh this is awesome. 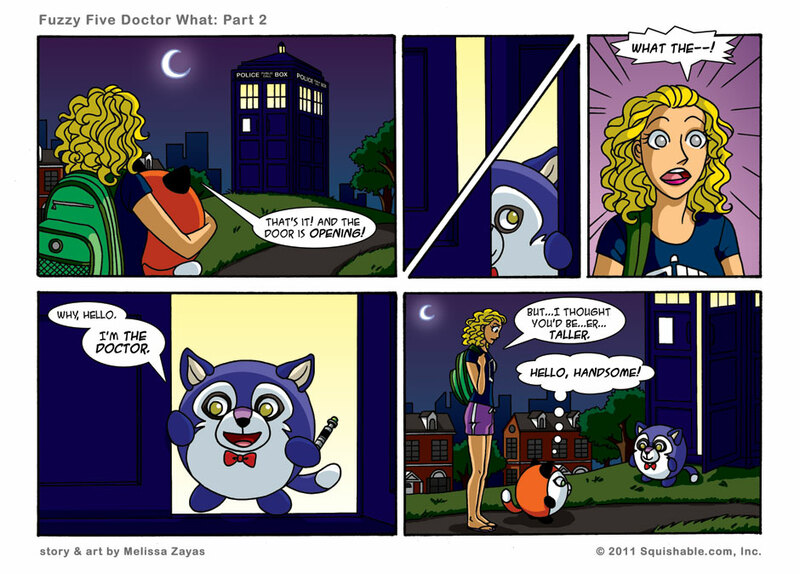 And having a squishableWolf as the Doctor makes SOOO much more sense than a doctor who keeps looking human! AAAAH THIS IS SO CUTE! I love the crossover, and that Spirit can be the companion! Love the screwdriver. OMG I’M SO HAPPY YOU DID CUTE SQUISHABLE WOLF AS THE DOCTOR! OMG !!!!!!!!!!!!!!!!! THIS IS AWESOME! I LOVE WOLVES AND THE DOCTOR!